Feline chronic kidney disease, also known as kidney failure in cats, affects about 30% of elderly cats, or those over 9 years old. It is a leading cause of death in domestic cats, and is common not only among older cats, but also within certain breeds. In fact, it’s so common, some experts call it an epidemic, taking special note of the fact that feral cats aren’t nearly as prone to it as their household cousins. Certainly the veterinary Experts on JustAnswer deal with thousands of questions about it. 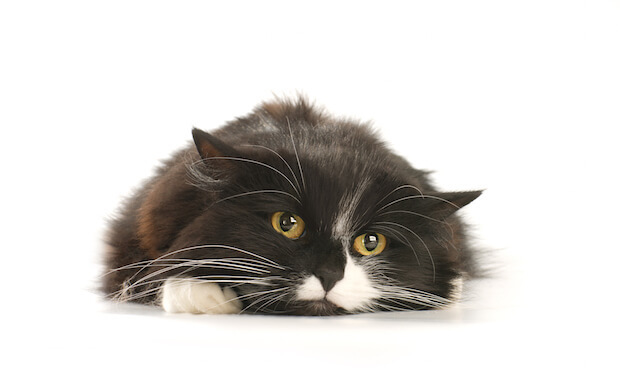 So what’s going on, and what should worried kitty parents do about kidney failure in cats? Why are feline kidneys so delicate? The kidneys are charged with eliminating protein wastes and balancing body fluids, salts, and acids. They also produce molecules that stimulate red cell production and help regulate blood pressure. But your cat’s kidneys are essentially filters designed to retain good fluids and allow waste to escape. Because cats were originally desert animals, these filters are highly complex and efficient, requiring very little water to function. The problem is that these efficient filters – the kidneys – like pretty much any complex mechanism, are also prone to breaking down. In short, your cat’s kidneys have a limited shelf life. And the harder her kidneys have to work, the faster the breakdown – and the shorter the lifespan. When the kidneys start to fail, the fluids a cat needs to survive start to escape along with the waste. This condition is called chronic kidney failure, which is treatable if caught in time. But with this condition, those kidneys are losing water faster than the cat can drink, which leads to chronic dehydration. 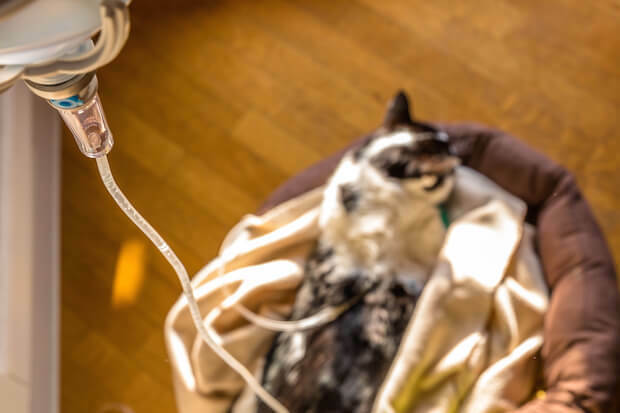 Dehydration can be dangerous for pets, which is why a cat with chronic kidney disease is often treated with intravenous fluids, among other treatments that we’ll get to shortly. Because kidney disease is so common, owners should be familiar with, and vigilant of, the signs of kidney failure in cats. Chronic kidney failure in cats is routinely treated by veterinarians, and afflicted cats can live comfortable lives for many years. This is evidenced by one JustAnswer customer whose cat was being treated for the disease for over a year when another small issue brought the owner to the online vet. “My cat has kidney disease and on IV fluids for over a year now,” explained the owner in setting the scene for the vet, who believed the cat’s constipation and diarrhea problems stemmed from another cause. As noted above, treatment for kidney problems in cats often includes plenty of fluids, administered intravenously if necessary, to avoid dehydration which worsens the condition. While there is no cure, treatments that prolong the cat’s life in comfort will include proper nutrition, medication, and regular checkups. If the disease is being caused by a blockage, surgery may be indicated. Most commonly, cats are given a special diet, which will include phosphorus and protein to reduce the load on the kidneys, and is enriched with vitamin D and omega-3 fatty acids. Other foods are allowable too, as long as the cat also gets the extra enrichment. Most important, however, are the fluids. Owners can learn to administer fluids intravenously at home, and kitties should be encouraged to drink more water with devices such as fountains. The main goal of such treatment, which, as mentioned above, can’t cure the disease unless caught very early, is controlling the buildup of waste products in the blood, delaying the progression of the disease, and maintaining the cat’s quality of life for as long as possible. All of this begs the question: How to prevent or slow the development of kidney failure in cats? One of the easiest and most obvious answers starts with keeping your cat away from the toxins listed above. And generally that means that indoor cats are safer, because they won’t be as likely to encounter poisonous snakes or insects, antifreeze, toxic plants, heavy metals, and trauma to the kidneys. Of course, all cats should be protected from toxic houseplants and human medications, too. Meanwhile, there’s also another way to address the issue of the defined lifespan of a cat’s kidney: reduce the workload. Dr. Karen Becker, who describes herself as “a proactive and integrative wellness veterinarian,” is outspoken about her belief that feline kidney disease is an epidemic, and she thinks she knows why. 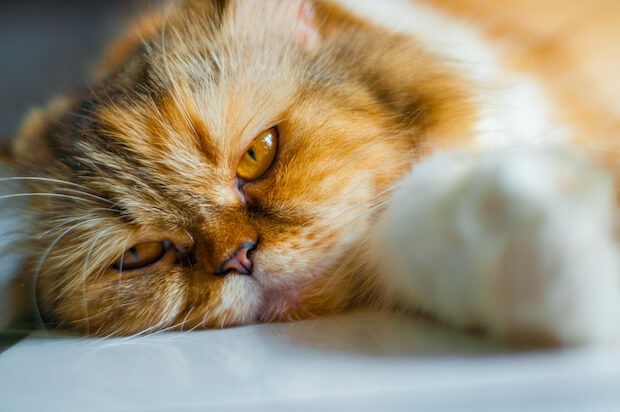 “Since kidney disease is a leading cause of death for housecats but not for wild cats, we must ask why feline renal failure in domestic cats is at epidemic proportions,” she says. Becker believes it’s critical to start feeding weaned kittens high-quality protein in its natural, unadulterated form. Instead, many of us do the opposite. Of course, you should check with your vet before making substantial changes to your cat’s diet, but it’s certainly worth asking. And in addition to skipping the dry food, Becker also advocates for “vigilant monitoring of organ systems,” again, something that your vet can help you with. Kidney failure in cats is almost inevitable, the only question being if another illness or accident takes kitty’s life before the kidneys quit. However, by being aware of these details and staying on top of your cat’s health, you can prolong your companion’s life and increase his comfort for the long term. And if you have any questions about kidney disease or any other feline health issue, the cat veterinary Experts on JustAnswer are always available, and are highly trained in identifying problems serious enough to warrant a trip to the vet. I adopted a cat from petsmart probably about two months ago.